First off let me start by saying I am now a Marathoner and I couldn't be happier with that fact. I am proud to join the 1% -2% of people who will ever run a Marathon! At the moment I am fluctuating between the “never again” and “When’s the next one!”. I could be in trouble if I am on a race website whilst in the “When’s the next one?” zone! Just over a year ago I ran my first half marathon. Since that time, I've completed 2 x 10k’s and another 4 half Marathons and now THE BIG ONE - a full Marathon. I've logged over 1300 miles since I set out on my first run in May 2011. If anyone had told me after that first run 18 months ago I would run a marathon I would have thought they had lost their marbles! 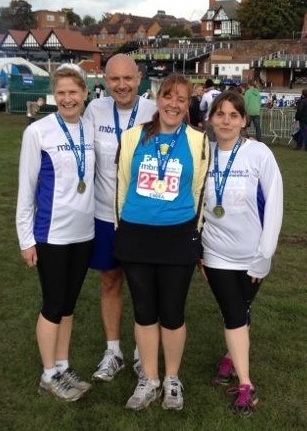 ME run a marathon – NEVER! However, after watching the London Marathon on TV I suddenly thought “I can do that!” and before I could think clearly I had entered my first marathon! When I initially told friends and family that I was going to run a marathon I was nearly always greeted with a look of “Oh! Yeah.. erm, good luck!” or “you crazy?”. So which marathon did I choose? and on Sunday, October 7th, 2012, I completed it! I felt extremely apprehensive going into the Marathon, but I kept telling myself I had put in the training hours and all I could do was my best! I was afraid of defeat. I was afraid I wouldn't be able to finish and I was afraid that I would embarrass myself. Here’s a report about my first marathon experience! We (My husband and me!) arrived in a sunny Chester on Saturday afternoon. We quickly located the premier Inn in Chester City Centre where we were staying. On check-in the very friendly receptionist asked “You here to run the marathon?” I gathered from her asking this question that the hotel was full of us!! The hotel was spotlessly clean with very comfortable beds at a very reasonable price. After settling in we went for a walk around the city centre and to suss out how to get to the race course where the race started. The race course was a 15 minute walk from the hotel and we found it easily. We were standing looking across the course at the start and finish points and I was feeling particularly daunted by the enormity of the task ahead when another couple appeared next to us. We got talking to them and the male half of the couple said he was running the race as well and his wife had just come along for the jolly (her words!). He had run 5 marathons so was able to offer tips and advice. After a lengthy chat we bid each other good luck for the next day and returned to our hotel to get washed and changed before heading out again for the prerequisite pasta meal. We had booked a table at Zizi’s restaurant which appeared to have attracted quite a few runners! We sat next to an “older” man and his wife who was a seasoned marathon runner and gleefully informed me the first marathon you run is by far the worst and hurts the most! That was not really the type of encouragement I needed. When the waiter came over to clear our table this gentleman informed the waiter that I was running the marathon too. He looked at me and said "You are? Really?". Do I look that unlike a marathon runner?!! After enjoying a delicious meal of Chicken Rigatoni and garlic bread, washed down with sprite (no wine or pudding for me tonight!) we headed back to our room and retired for the night! I had a very unsettled night’s sleep. I was awake every hour on the hour panic stricken that I was going to miss the start! Eventually the alarm went off and as I blearily eyed looked at the clock to confirm that it was actually 7.30am, I realised that I was unable to focus and the world was a blur! I will explain at this point that I wear contact lenses I keep in for the entire month and sleep in, and I never ever have any problems with them moving until now ...! After several minutes of rapid blinking and twirling my eyeballs around I realised I was missing my right contact lens. 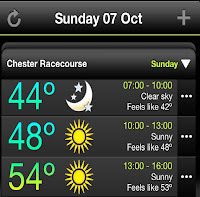 DISASTER – I hadn't brought any spares or my glasses and my first thought was “How am I going to be able to see the pace on my Garmin? !” After scouring the pillow, bed and floor and then nearly poking my eye out just in case it had moved but was still in my eye I resigned myself to running blind! This little hic-up unsettled me further and by now the nerves were indescribable! I somehow managed to eat my pre-race breakfast of a porridge pot and banana, got dressed in my running gear and attached my race number with safety pins. This was another worry – I realised I would have to pin my number high up on my chest opposed to where I usually pin it lower down over my stomach as I was wearing a waist running belt (with my gels and supplies in) and it would cover the number if I pinned it too low. I didn't need this extra stress, I was muttering my mantra “I can do this” like a mad woman trying to remain cool, calm and collected. Would the running number irritate me being in a different place? Tough I had no choice! Just as I was putting on my trainers my husband announced “ I've got it!” and held up a rather sad looking wrinkled and folded up contact lens! I initially whooped with delight until I saw the condition of it – I was never going to be able to see out of that ever again! Luckily my husband is also blind and wears contact lenses and he had the necessary cleaning solutions with him, so I popped it into the solution then I finished getting sorted and hey presto by the time I went back to it, as if by magic it had sorted itself out! Hallelujah I could see again!!! One less thing to stress about! It was a fine, clear morning when I set out of the hotel but very, very cold. Nervously waiting for it all to begin! We headed off towards the race course and on the way unbelievably bumped into a running friend. 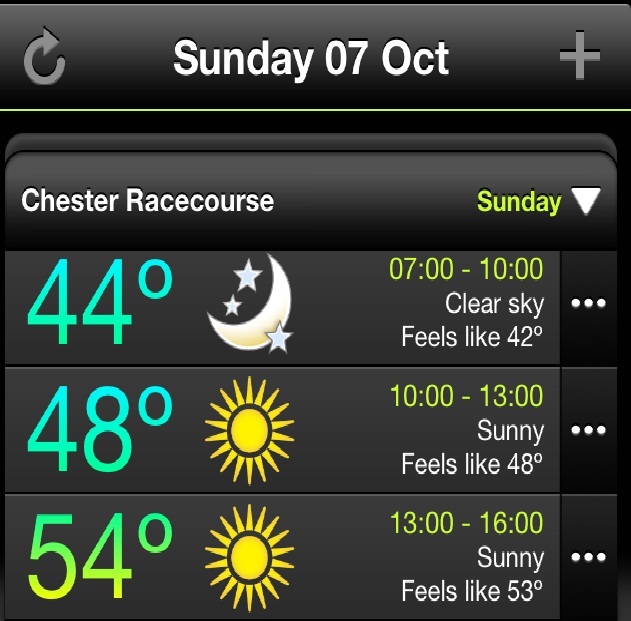 What are the chances of that with 3000 runners milling around! Once on the race course we had to tip toe around big muddy puddles (I didn't want wet socks before I started!) as we headed towards the Porta-loo’s for my last nervous wee. I said good bye and good luck to Carl before joining the loo queue. The queues were long as usual at these events but seemed to move fairly quickly. You couldn't mindlessly wait and move with the flow as you had to have your wits about you so you didn't disappear into a puddle right up to your middle!! 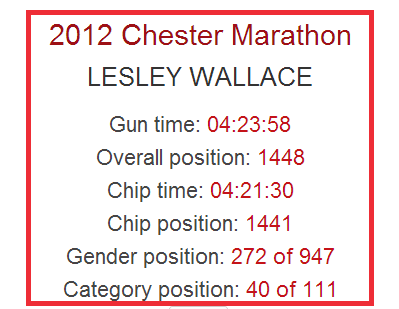 I would like to nominate Chester marathon for the cleanest “Race” toilets award! I always cringe when I open the door to these disgusting places and this time I was pleasantly taken aback – clean, fresh smelling AND Toilet paper! Now that’s a first in my experience, I always carry some in my pocket! The timing zones had not been allocated with the race number (which is the norm in my experience), so it was a case of self selecting the zone you thought most appropriate for your ability! This is a much better idea as sometimes you improve substantially from the initial race application and would like to go in a faster zone or you may have suffered an injury and would like to go in a slower zone. Anyway, after saying my good-byes and feeling extremely emotional I decided to head towards the back of the sub 4:30 pen. I didn't want to be carried along by the tide of speedy runners; I was determined to run my own race at my own pace! The racecourse was sodden, and with thousands of people trampling all over the place, this meant the ground had turned into a quagmire in places. I waited nervously making idle chit-chat with other runners whilst we waited for the pre-race speeches to be over and for the race to be started! Eventually, just after 9am the race got underway but we first had to negotiate half a lap of the soggy sodden race course, then a part reinforced with a sort of plastic grid (not good for the ankles or feet so early on!) before heading out onto the streets of Chester. The sun was shining, the sky was blue, life felt good! I soaked up the atmosphere and support of the crowds and soon I had passed under the arch in the city centre. Once the crowds started to thin out I started my I-pod and settled into my pace listening to music trying to remain calm and relaxed. I felt much better for actually running! This is what I had trained for! I had calculated to get my "ideal" goal time I needed to keep between 9:30 and 10:00 min/miles. I ran the first mile in 9:59 and realised with my obsession and worry about setting out too fast I was risking going too slow so sped up slightly! I was surprised to see just after the mile marker a hill – the course was described as FLAT – I beg to differ on this point! There was most definitely hills, and more than one! Leaving the town centre behind, the route took us through the picturesque Cheshire countryside and it was lovely to have beautiful scenery to take my mind off the task in hand! There were "wheeled" St John’s Ambulance staff weaving their way through the swarms of runners on cycles obviously trying to get further along on the route to a point where they might be required in an emergency. However, due to the quantities of runners they were struggling to successfully navigate around people and just after wobbling past me one of them clipped the heels of the runner in front and sent him sprawling! If I had been that runner I would have been livid! I was amazed to see people walking as early as 4 miles – it was going be a long day for them at that pace! The route went along closed country roads and through several small villages. The support in these places was fantastic. The villagers were all supporting us and cheering as we passed through! Children were high fiving and offering jelly babies too, making it a super friendly atmosphere to run in! The drinks stations appeared very regularly every 3 miles or so, interspersed with energy drink and gel stations. I had brought my own gels not wanting to risk getting a dicky tummy using something unfamiliar, so only slowed for water! These stations were manned by hordes of very keen, happy and supportive young people - perhaps a local scout or youth group? They deserve a lot of credit and a pat on the back for the marvelous way they handled the situation and their attitude! At around mile 10 on the route it was slightly disturbing to be running along a country road with hundreds of runners heading back towards me after doing a loop somewhere. I had assumed when I first saw the runners that I would soon be heading back the way I had come not realising it was actually a 3 mile loop! It felt good though when I was the one heading back towards the outward bound runners! Somewhere around this point I think we entered Wales before returning back into England. However, I was oblivious to where this border was and didn't notice any "Welcome to Wales" or "Back in England" signs! I just have to take the word of the organisers (and the map) that I did do it! The miles began to tick by, I was obsessed with looking at my Garmin but was pleased to see I was maintaining a fairly consistent pace– 9:20, 9:29, 9:32, 9:31, 9:43, 9:48, 9:39, 9:39. 9:42, 9:43, 9:47, 9:52. At this stage of the race we were approaching the half way point and I crossed the timing mat in 2 hours 10 minutes right on schedule for my finishing goal. Things were looking rosy, but now the tricky part was to maintain the pace in the latter parts of the race! At this point I felt great and for the first time dared to believe that I could actually do this! The next few miles passed without incident. At 16 miles some really athletic looking club runners start to blow up. They started walking, struggling to jog a bit and then giving up again. I felt surprisingly OK. I think all the support boosted my morale and gave me a much needed boost. As I passed mile 18, I started to see a lot of people by the side of the road. Some with injuries, some stretching, some just clearly went out too fast. I went past them feeling quite smug that I had managed to rein myself in and not make the mistake they had. circumstances these small hills wouldn't alarm me but after running 24 miles it felt like I was running up Everest! I gritted my teeth and kept going determined not to walk! I started to hate the experience and began to wonder why I was doing this to myself! My legs were sore and felt very heavy and uncooperative however the support coming back into the town along the river was fantastic. My husband popped up along the river shouting "Keep going - only a third of a mile to go!" - it felt like an interminable distance! Only a third of a mile to go! I was delighted to re-enter the race course but not so delighted to be back to running on the muddy grass. By this point however the big mud puddles had been covered with sand and grit! I tried to push my legs to finish in style and felt full of emotion and relief as I crossed the finishing line! …the feeling of accomplishment after pushing through such a challenge made all the pain worthwhile. I no longer hated the experience. Instead, I found myself loving it. I had pushed my limits and reached my goal. It took 4 hours, 21 minutes, and 30 seconds out of my life. In exchange for the experience of a lifetime. There was lots of friendly faces and enthusiastic support as I went through to collect my medal, my long sleeve finishers T shirt and goody bag! This was one piece of bling I felt I truly deserved and I felt like I had just won the Gold in the Olympics! I felt so so proud! The goody bag was very generous as far as goody bags go - containing a long sleeved T shirt, BIG family bag of Haribo's, a finger of fudge and a full sized mars bar along with a bottle of water! Much better than the usual healthy nut and raisin bar and razor! Just as I emerged out of this area my husband was proudly waiting to congratulate me! We met up with some friends who had also run, all getting PB’s and one even managed a fab sub 4 hour time! We headed to a nearby pub for a celebratory drink before heading off home! You can view my run and the route by clicking here! I used a number of strategies to get me through the day.I think what really helped me was all of the visualization I had done leading up to the race. Every day, several times a day, I held a very clear picture in my mind of how my race would go, from how I would feel at the start, to pushing through any tough points in the middle, to the exhilaration I would feel at the finish. Prior to race day I had also stuck motivational stickers on my bedroom mirror (received ridicule from my family for this) which I chanted to myself every time I sat down at my dressing table! I think chanting these during the race gave me the extra umph to keep going when things got tough! I also broke the run down into segments. Instead of thinking I have 26.2 miles to run I thought of the first 6 miles as a warm-up, then I was “doing” a 18 mile run and then a 2-mile cool down. During the “actual” 18 mile run I mentally wrote my blog about the race. At times I was looking around trying to eyeball something "happening" to make my blog more exciting to the reader. 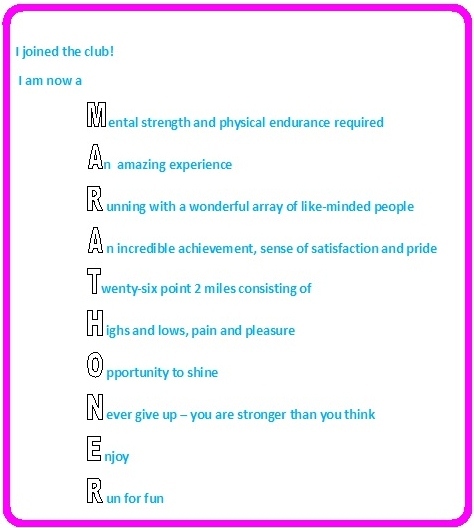 I also mentally “wrote” an acrostic poem using the word marathoner (as I was about to become one!). Doing this I had managed to cover several more miles and forget about my moaning legs!. I also really felt like I had sorted my nutrition during my long training runs; I never once “hit the wall” and I feel this was in large part due to the fact that I was getting the nutrition (in the form of gels and fluids) that I needed at regular intervals. I was amazed I had managed such even splits, 2:20 for the first half and 2:21 for the second! Being Garmin obsessed had definitely worked! 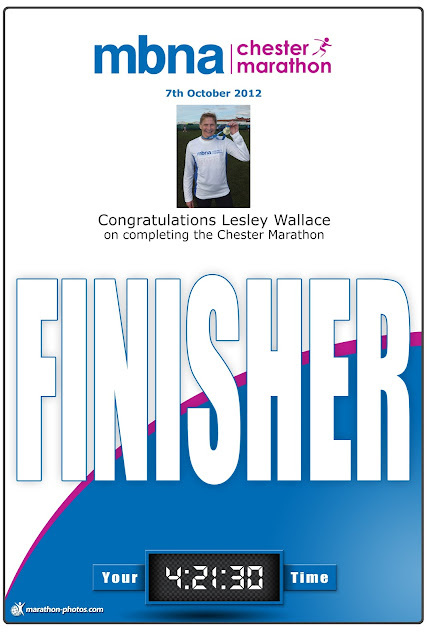 I was delighted to have achieved (or very nearly!) my realistic goal time as I was sure I was going to come in slower due to race day nerves etc. I would like to remain more calm and relaxed before race day and not stress out as much. Possibly enjoy the day more by relaxing but all in all I feel for a first attempt I didn't do too badly. Perhaps next time – run faster to achieve a PB?! I am now 3 day post run and for the first time I have managed stairs without that owchy feeling! But all in all I have been amazed how swift my recovery has been! I think I may actually be suffering post marathon blues! If you have done a marathon you will know the highs and lows, the pain and pleasure and the sacrifices and rewards it takes and gives you. If you have not done a marathon then I strongly urge you to do so! For the full results click here!